Lovers of cheese, bacon and ranch unite! This AMAZINGLY delicious Cheesy Bacon Ranch Baked Potato Slices Recipe is a great way to get a lot of mileage out of a potato. 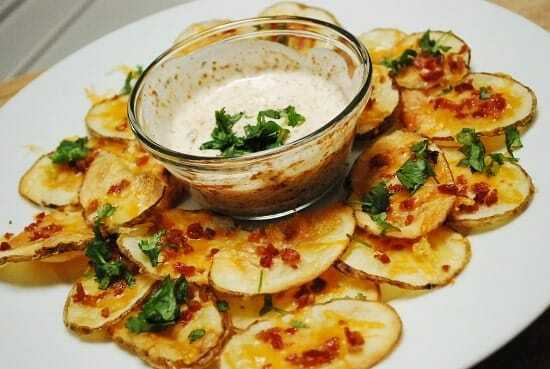 Rather than a typical baked potato recipe, this potato is sliced into thin rounds and topped with melted cheese, REAL bacon crumbles and served with a Chipotle Ranch Dipping Sauce. Share the whole plate with a friend and each serving is just 7 Points. Not bad for a nice portion of deliciousness that tastes like it’s a LOT higher in Weight Watchers Points than it is. It is the perfect junk food craving satisfier! So if you are having a day where you feel like running to the nearest drive through, make these delicious Cheesy Bacon Ranch Baked Potato Slices instead, and feel like you indulged. This dish also makes a fabulous Weight Watchers Super Bowl Recipe idea, so make sure to keep it in mind come January :). A delicious and satisfying comfort food classic, these Cheesy Bacon Ranch Baked Potato Slices are amazingly good! Share the whole dish with a friend and it’s just 7 Points per serving. Bring sliced potatoes to a boil in cold, salted water to cover for 5 minutes. Carefully drain, and transfer slices to a paper-towel lined countertop or cutting board. Pat to dry. Spray a baking sheet with cooking spray, and lay out potato slices on it. Bake 12-14 minutes in preheated oven until potatoes begin to slightly crisp and brown on the edges. Remove from oven, and cover evenly with cheese and bacon bits. Return to oven and cook until cheese is melted and bubbly, about 10-12 minutes. Meanwhile, to prepare Chipotle Ranch Dipping Sauce, combine light ranch dressing and Chipotle seasoning. Garnish potatoes with optional chives or parsley and serve immediately with dipping sauce.